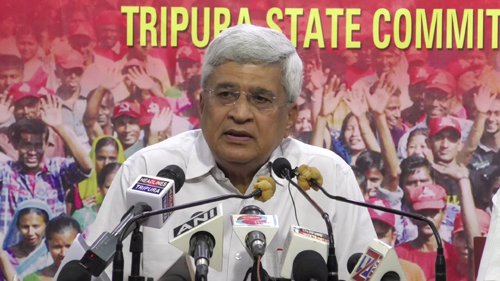 Former CPIM General Secretary Prakash Karat has suggested India government shun ‘false prestige’ and accept the UAE donation for Kerala floor relief, at an event in Agartala. Recently the United Arab Emirates (UAE) wanted to donate Rs 700 crore for flood-hit Kerala which the India government denied accepting. Giving details about the devastating flood situation the CPIM leader viewed that the initial estimates of the Kerala government of the loss due to recent flood is Rs 20,000 crore but so far only Rs 600 crore has been sanctioned by the central government. And at this time some of the foreign governments have come like the United Arab Emirates government came forward to offer assistance of Rs 700 crores for relief and rehabilitation but without consulting the state government the central government has declined this request. According to Karat in UAE majority of the workforce which through their hard work and labour is building that countries economy are Indians and out of those 80 percent are from Kerala and in response to that it is natural that UAE is offering this help of Rs 700 crore but India declined to accept that. The CPI-M leader was here to attend the party’s state committee meeting, which discussed various issues including “ongoing political violence in the Bharatiya Janata Party (BJP) ruled state”. Accusing the Modi government of its “misgovernance on the economic front”, Karat said that farmers, Dalits, and unemployed people are the victims of the BJP-led NDA government. “Sexual attacks on the minor girls are rampant in many BJP ruled states. Mob lynching in the name of cow slaughter, beef eating, and child lifting has been going on. Despite the Supreme Court’s strong observations against the crime, mob lynching is going on in many parts of the country,” he said. The CPI-M leader said that the BJP-RSS leaders and cadres are continuously campaigning against the minorities and Dalits creating a serious fear and hatred situation across the country. He said that over two lakh farmers and workers would assemble in Delhi on September 5 to press for their demands, which include providing better wages, more jobs, better prices for farm produce etc. “The Mazdoor Kisan Sangharsh Rally’ would mark a new stage in the struggle of working people of India for a better life and just future,” Karat added.